We all know that life is always not fair and that there are no guarantees. This becomes painfully evident when a child is diagnosed with cancer. Our assumptions, security, and worldview are dramatically altered when the health of someone we love is threatened. As parents, the safety and security of our children is our responsibility. We teach them to brush their teeth to protect them from tooth decay. We teach them to stay away from strangers to protect them from being harmed or mistreated by other people. However, in reality, we have no control over so many things in our children's lives, and we cannot protect them against cancer. Subsequently, when a child is diagnosed with cancer, families often feel the same sense of helplessness, anger, depression and fear of people who suffer through any traumatic event. Being told a child has cancer is certainly a traumatic event. The shock of diagnosis often results in an overwhelming number of intense emotions. Both patients and their families experience these emotions. Many people have heard about the emotional stages we go through in dealing with trauma: denial, anger, bargaining, depression, and acceptance. It is important to remember that we don't go through these stages in a neat and tidy progression. When you've gone through anger to bargaining, it does not mean that you will not be angry again at a later time. Many of these emotions reappear at different times during your child's treatment. Denial can take many different forms. Some parents may keep going from doctor to doctor, looking for someone to tell them that the diagnosis of retinoblastoma is wrong. While denial may prevent some parents from getting their child treatment, it can also serve to protect you from the overwhelming impact of your child's diagnosis and keep you from being immobilized by your emotions. Like denial, anger is a normal part of the healing process. You may be angry at yourself, your spouse, God, your doctor, and even with your ill child. It is important to remember that while feeling angry is normal, the ways you choose to express this anger may not be helpful. It can be helpful to take a moment to recognize the source of your anger. When something so awful and beyond our control happens in life, it is understandable to want to find someone or something to blame. We want someone or something to be responsible for the pain we suffer. Anger at yourself can take the form of guilt, another common and normal response to childhood cancer. This reaction may be a way of helping to cope with the necessity of accepting a situation that you want to change but cannot. Parents tend to blame themselves and physicians for delays in diagnosis. They may look for things that they may have done to cause their child's illness. Parents may ask: "What could I have done to prevent this? ", "Was there something in the environment that caused this? ", or "Why didn't I recognize the disease sooner?" Mother's may want to know if they did something wrong during pregnancy to cause the cancer. Parents need to remember that, as far as scientist can determine, nothing they did or didn't do caused their child's illness to occur. Making deals, such as "If my child gets better, I promise I will always be a perfect parent", is part of the bargaining stage. Depression, feelings of helplessness, hopelessness and sadness can occur throughout the cycle of grieving and beyond. Eventually, most parents come to accept the diagnosis and that nothing they did or didn't do caused their child's illness and that with their support and good medical treatment, their child will go on to have a happy, healthy life. It can be difficult to juggle the many roles parents have. In addition to being a parent, you may have job responsibilities and important relationships with your spouse, your parents, your siblings, and your friends. A child's illness can put additional demands on your finances, your time, your energy, and your emotions. Think of times you may have been on an airplane and the flight attendant says that if there is a problem, you should place the oxygen mask over yourself before helping you child. The reason is that if you pass out from a lack of oxygen, obviously you will not be able to help anyone else. The same is true in any crisis. If you don't take care of yourself, emotionally and physically, you won't be able to take care of your child. Eating healthy, exercise and rest are extremely important. Talking with family or friends about their feelings is helpful to some parents. However, sometimes family members are so overwhelmed with their own feelings that they cannot be helpful to you. Even well meaning friends may not know how to be of help to you. In addition, this is a time when your child may be particularly sensitive to your moods and feelings. While it is important for parents to talk about their feelings, expressing these feelings too strongly in front of your child may create problems. This does not mean that you should not let children know that sometimes you may be angry, worried, or sad. However, also let them know that you are an adult and is not their fault that you have these feelings and that it is not their job to comfort or take care of you. Children who feel it is their job to emotionally protect their parents may stop talking to their parents about their own feelings, thereby cutting them off from their most important source of support. While expressing your feelings directly to your child may be problematic, parents do need to find healthy ways to deal with the emotional turmoil they may be experiencing. Many parents find counseling or a support group of parents dealing with similar problems to be very helpful. 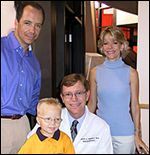 The repercussions of retinoblastoma, its treatment, and its outcome are felt throughout the family. It affects the daily functioning of each individual family member as well as the family system. Families, like other systems, seek an equilibrium, or balance. Think of the family system as being like a mobile. When one part of the mobile moves, all the other parts also move until balance is restored. When an external stressor, like cancer, impacts the system, the family must somehow adapt to the new stress, and reestablish a sense of balance. Illness also can be a drain on your family's financial resources. Even with insurance, there are likely to be some costs you will incur and many parents lose time from work during a child's treatment. Dealing with insurance companies, billing errors, and payments is a major stressor for many parents. Read you insurance policy carefully to better understand the benefits and claims procedures. Keep all hospital bills, doctors bills, insurance explanation of benefits, prescription records, other tax deductible receipts (tolls, parking, meals, hotels) and all medical correspondence in a separate file may help prevent a financial catastrophe. State and federal programs may be sources of financial assistance for some families. When so much of a family's energy is focused on an ill child, it may be difficult to find the time to spend with other family members. If a child with retinoblastoma has older brothers or sisters, in addition to adjusting to a new baby in the family, they must adjust to having a baby who may require an extraordinary amount of parental time and attention. Most siblings worry about their sick brother or sister and may be afraid they or their parents will get cancer too. Despite their concern, it is natural to feel jealous of all the attention the child with retinoblastoma receives, to be angry and blame the sick child for the family turmoil, and then feel guilty about having these feelings. Even if you have carefully explained what is happening to your other children, you may need to tell them over and over again what is going on. You may not have large amounts of time, but it is important to be available to listen, to let your children know that their feelings matter, and that they are loved and cherished every bit as much as their sibling with cancer. A variety of therapies and activities can provide families with the tools to move forward in the coping and recovery process. Even families that have adequate resources to cope "on their own" may find that periodic counseling can actually accelerate the recovery process. When combined with social support and existing coping strategies, counseling and other therapies can have a significant impact in helping families recover from the initial trauma of having a child diagnosed with retinoblastoma. For further information about these therapies, feel free to contact The Courtelis Center, University of Miami at (305) 243-4129 or http://www.miami.edu/courtelis-center. Being a parent is tough enough without having the additional stress of cancer. While you probably a have a whole medical team advising you on how to best care for your child's physical health, you may have fewer resources helping you with your child's emotional well being. It is unlikely that very young children will have a good understanding of their medical condition and treatment needs. What they are more likely to understand is that a lot of people in white coats keep poking at them, that sometimes they feel bad, and that the important adults in their lives are in turmoil. When so much of your focus is on a child's illness, it may be difficult to remember that when this crisis is over, you child will need to the same life skills any child needs to be a well functioning adult. While it is natural for parents to overprotect and overindulge a child with retinoblastoma to "make up" for all they are going through, spoiling a sick child has the same result as spoiling a healthy child. A child will feel normal only if he or she is treated normally. You should expect the same age-appropriate skills and enact the same discipline as you would if your child didn't have cancer. Good parents want to provide their children with the best possible experiences for learning and developing. Children with visual impairments need to enjoy the same day-to-day and special experiences that other children enjoy. All children need to learn to dress themselves, do chores, play, and get along with others. While a child with a visual impairment at first may need some extra help, you should expect your child to learn the skills he or she will need to live independently. Here are some suggestions that other parents have found to be helpful. Help your child learn to use sight, smells, sounds, surface changes, and textures can be used as cues to the environment. For example, the change from tile to rug may alert a child that he or she is moving from the kitchen to the family room, or cooking smells mean that it's time to eat. Create opportunities and challenges for your child to learn. Children cannot learn what they don't experience. Use real objects and experiences as much as possible. Help your child understand that things don't just happen. For example, milk doesn't just magically appear on the table. Let your child experience opening the refrigerator door, picking up the milk carton, pouring milk into a cup, and placing the cup on the table. Point out visual features of objects, for example a toy's color or texture. "Look" and "see" are perfectly good words to use even if your child is totally blind. Direct indoor lighting or sunlight coming from behind, over your child's shoulder, may help your child use his or her vision more effectively. Try to minimize glare from light reflection off an object as glare can make it more difficult to see things. It usually is easier to see bright colored objects placed against an obviously different background. You can change the color of a surface to provide greater contrast by placing a light or dark cloth over it. Try not to bombard your child with sensory overload. Too many toys or too much stimulation can make it difficult to focus on a task. Children with a visual impairment may not be able to see facial expressions or body language that tell them that they are being spoken to. Use your voice to convey meaning. Especially if there are others in the room, speak to your child by name. Teach your child to lean his or head toward the person who is speaking. Use hand-over-hand or co-active movements to introduce your child to a new skill. You might want to get an idea of what you are asking your child to do before you have your child do it. Try to experience the world for you child's point of view. Help your child learn on his or her own instead of always doing things for your child. Trust your child to succeed and encourage your child to work through frustration. Since 98% of children with retinoblastoma are diagnosed before the age of 5, returning to school may not be an issue for your child. However, retinoblastoma can leave your child with unique educational needs. Late side effects from treatment may include hearing or visual loss or social difficulties that can impact your child's learning. Some children with retinoblastoma may need extra help in the school environment. The Individual with Disabilities Act (IDEA) requires that every public school provide free and appropriate education in the least restrictive environment to all handicapped individuals between the ages of 3 and 21 years. Public schools are required to provide an individually designed instructional program for every eligible child. At-risk infants and toddlers are eligible for early intervention programs. If services are denied, parents can challenge the decisions of the school system, with disputes being resolved by an impartial third party. If you believe that your child would benefit from special education services, you may ask the school to develop an "Individualized Education Program" or IEP. Unfortunately, some school districts don't offer special services unless parents ask for them, and many parents are not aware what services are available. Once the school district has received your request for an IEP, they will need your written permission to evaluate your child. This evaluation will determine whether your child needs special education services. When the IEP evaluation is complete, the school district will review the evaluation with you and write an education plan that fits your child's needs. You may want to schedule a conference before your child's first day of school. In some cases it may be helpful to share some basic information about your child's diagnosis and treatment. For example, if your child has had an enucleation, it can be helpful to explain that your child has a prosthetic eye and needs to wear protective eyewear. If your child has a visual impairment, seating in the front of the classroom may be beneficial. Explaining your child's situation may help open the lines of communication and decrease curiosity, discomfort or even teasing by other students. Some parents may conceal their children's medical problems for fear that their child will be treated differently. This might unintentionally signal others that retinoblastoma is something to be ashamed of or feared. It's important not to focus solely on your child's limitations. Some teachers may need to be reminded that first and foremost your child is a student, not a patient, in the classroom.